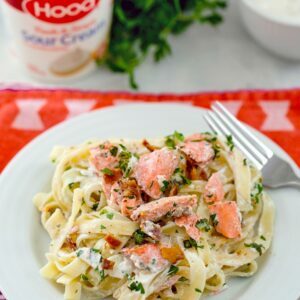 This deliciously creamy salmon fettuccine pasta dish is packed full of flavor thanks to a caesar sauce made with Hood Sour Cream, lots of fresh herbs, and bacon. Bring a large pot of lightly salted water to a boil. Add fettuccine to pot and cook for about 5 minutes, until al dente. Drain pasta and return to pot. While pasta is cooking, sprinkle salmon filets with salt, and pepper. Heat oil in a nonstick skillet over medium heat. Once hot, place salmon in pan. Let cook for about 3-4 minutes. Flip filets and let cook until salmon is firm to the touch, about 2-3 more minutes. Flake salmon into small pieces and add to the pot with the fettuccine, along with the sour cream caesar sauce, crumbled bacon, parsley, and basil. Toss until all ingredients are combined and coated in the sauce. In a medium bowl, whisk all ingredients together until well combined. Keep sour cream caesar sauce covered in fridge until ready to use.